Today I want to start with the first blog of the remoting protocol series. Before we start with our VDI or RDSH project we should think about the customer use cases they want to cover with the vGPU solution. In the past, I’ve seen a lot of projects, where the customer claimed to have issues since using a GPU enabled desktop. But in most situations it is not the GPU but the remoting protocol that is not configured or optimized for the given use case. Therefore we need to understand the difference between Bitmap and Video codecs in the first step to better understand what kind of policy set should be used for the customers use case. We will use the Citrix stack for this series of blog posts but if I find some more time, I will do the same for VMWare Horizon. Bitmap remoting @Citrix is based on JPG compression and RLE (Run Length Encoding) which is a Citrix specific invention. See here if you want to read more details about RLE. Bitmap remoting, also known as “Thinwire” for many years is a very bandwidth efficient remoting protocol for static content. In addition, the Visual Quality is close to the original image and we even have options to further improve the image quality with Lossless policies to gain “Pixel perfect” quality sometimes necessary in verticals like Medical. That said, it is a good choice for Office related use cases like knowledge worker VDI or XenApp uses cases. Most of the time the users are working with Office applications or ERP software where we don’t see much screen changes and therefore the bitmap remoting is very efficient. Most customers want to use a Thinclient instead of Fatclient for their end users. These Thinclients are often pretty old already or don’t even support hardware decoding (we will discuss this later). Bitmap remoting doesn’t need specific hardware at the endpoint and is not very resource consuming so it will run on every Thinclient available. As just mentioned for the endpoint, there is also only moderate CPU load necessary to do bitmap compression. 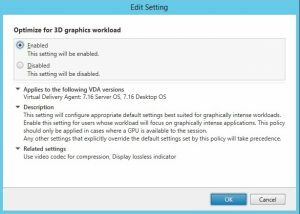 But there is no option to offload the encoding to the GPU (NVENC). as we have seen above, bitmap remoting works pretty well for static content but as soon as moving images or video playback comes into play, the situation is different. The higher the framerate required (30fps, 60fps) the more images need to be transferred with bitmap remoting and this heavily impacts the bandwidth required and the overall performance. This is exactly where the video codec makes sense. The video codec (H.264, H.265) encodes images by implementing less resolution for chroma information than for luma information, taking advantage of the human visual system’s lower acuity for color differences than for luminance. This allows smooth video playback or working with 3D models even with high framerate at low bandwidth requirements and is therefore also usable for WAN scenarios where users are working from home or at remote locations with low bandwidth connections. Here you should already see a huge difference in “human eye” comparison between the reference image and the captured image. 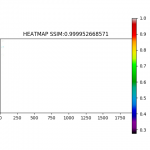 In addition the SSIM heatmap shows a result of 83% accuracy. You should now better understand why the users may complain about test blurriness with YUV420. 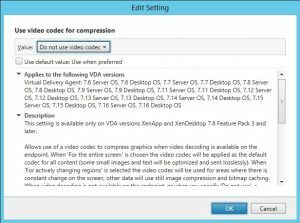 As soon as we use a video codec like H.264 we need to encode the captured images server side and decode the stream on the endpoint. This is a quite “expensive” task and requires up to 1 vCPU with H.264 if we cannot encode with hardware. The good thing is, that Citrix supports hardware encoding (NVENC) with our Tesla GPUs so we can offload this task to specific ASICs on the GPU present for these tasks. Encoding in hardware is always faster compared to CPU based encoding and therefore we see a good reduction in latency. To give you an example you can calculate with 4ms for GPU encode compared to ~30ms with CPU. Our endpoint needs to be capable to decode the video stream. So it needs to either have a hardware decoder or it requires a modern CPU with enough performance to decode the stream. Same applies here in terms of latency. 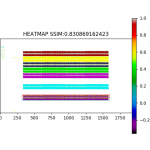 Hardware decoding is preferred as it reduces the overall latency. So if we have a very old Thinclient it may happen that it is unable to cope with the decoding which leads to degraded end user experience. Citrix supports NVENC (NVIDIA Encoding) for the encoding in hardware. With offloading the task to the GPU we have a massive benefit in terms of encoding CPU load which is very low, even lower than with bitmap remoting. Enable this policy to use NVFBC (Nvidia Direct FB access) and also NVENC (Nvidia Encoding). 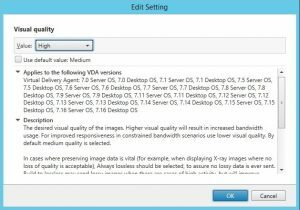 For NVENC to work even on older XenDesktop versions (7.12 – 7.16) it is necessary to use the entire screen policy. It doesn’t avoid the chroma subsampling but High gives a pretty OK quality for most of the use cases. There is also not much difference in bandwidth consumption between Medium and High policy so that I would recommend “High” as a starting point. In the meantime the usage of “H.264 YUV420 only” is decreasing. There are several reasons for this, the main reason is the “chroma subsampling effect” and the presence of better alternatives. 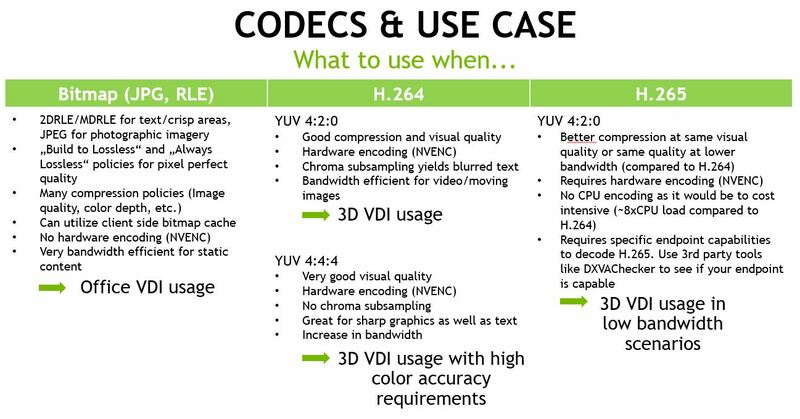 With later Citrix versions starting with 7.17 we now have “mixed codecs” (bitmap and video) that reduce the use cases for H.264 entire screen to “3D VDI usage” where high color accuracy is not a mandatory requirement. I will explain the mixed codecs in detail in another blog post of this series.